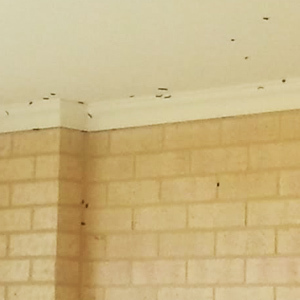 If you’ve ever wondered what those small black crawling things are that seem to come out of nowhere and invade your patio and even come inside your house? They are most likely Portuguese Millipedes. These “caterpillar” like creatures where first spotted in Roleystone around 1986 but have spread throughout metropolitan Perth and down to our south west. Portuguese Millipedes are what we would call a “nuisance pest”. They’re harmless to humans and animals but are a problem by way of their sheer numbers. 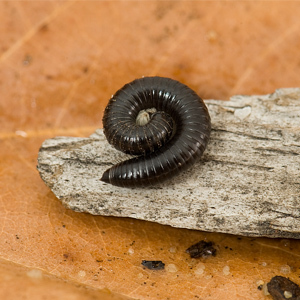 These millipedes are recognised by a smooth, cylindrical body approximately 20 – 45mm long and slate grey to black in colour. They will curl up into a flat spiral when disturbed and may emit a yellowish secretion (an organic chemical) that could stain clothes but is otherwise fairly inert. Portuguese Millipedes reproduce in autumn and early winter and hence will appear most abundant after early winter rains. They tend to live in mulched and leaf littered areas and can congregate in very large numbers. 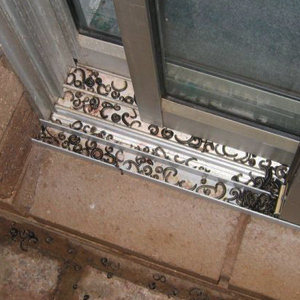 The millipedes are attracted to light and can be seen crossing paths and outdoors to lit areas and quite often will be seen in large numbers climbing walls, doors and ceilings. It’s worth noting they won’t breed inside houses and will probably die but having a number of small creatures walking through one’s home is something none of us relish! Stopping the Portuguese invasion isn’t easy. Physical barriers, light or water traps etc may provide a little short term relief but there’s no real long term solution. Perth Pest Control provide an effective non-solvent treatment that is essentially an external spray we apply to all suspected breeding areas and home surrounds. Although we provide a 3 month warranty on our Portuguese Millipede treatment, the nature of this pest is such that in following seasons they will return and further treatments may be required to quell their numbers. Contact us for further details. I’ve seen a lot of what I thought were small caterpillars on my walls, are these actually Portuguese Millipedes? In all likelihood yes. Portuguese Millipedes do have a cylindrical body like caterpillars and move similarly. What sets them apart is they will appear in large numbers and usually around early winter when the first rains have come. Do Portuguese Millipedes pose any sort of threat to my children? No, they are really just ‘nuisance pests’. They don’t carry disease and the worst effect would be if a yellowish secretion they carry stains your clothes. How do you treat for Portuguese Millipedes? Our treatment involves the use of a water based spray we apply externally. This will eliminate the existing numbers but be aware that the chemicals in the treatment we use will break down over time so there’s a good chance the millipedes will return next season. 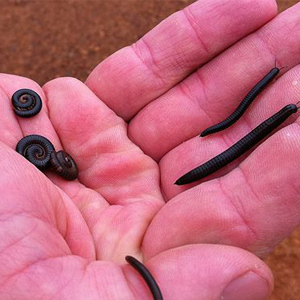 Perth Pest Control does give a 3 month warranty on our Portuguese Millipede treatment.